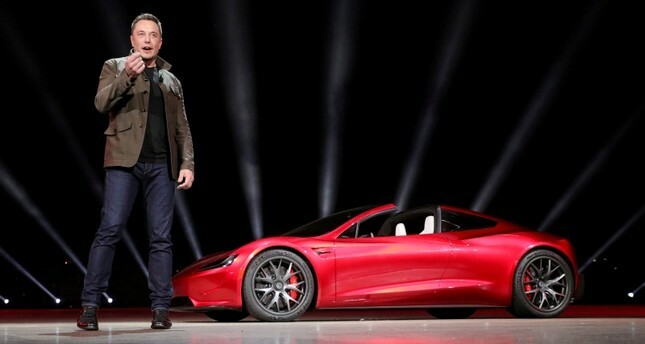 Regulators suspended trading in Tesla Inc's stock late Tuesday after Chief Executive Elon Musk said on Twitter that he was considering taking the electric car maker private at $420 per share. The shares of the company, which is going through a period of rapid growth and financial constraints, jumped more than 7 percent after the surprise tweet. Such a deal, if it went ahead, would take Tesla out of the glare of Wall Street but might limit its access to capital. It would be one of the biggest go-private deals on record with a price tag of about $72 billion, based on $420 per share. That price would represent a 22.8 percent premium to Tesla's closing price on Monday. Tesla did not immediately respond to a request for confirmation or clarification. When another person tweeted that going private "saves a lot of headaches," Musk replied, "Yes". Tesla's shares jumped as high as $371.15 in afternoon trading. They were later halted for news pending. The company had a market value of $58 billion as of Monday's close. Musk owns nearly 20 percent of the company. Going private is one way to avoid the intense scrutiny of public markets. Musk has had feuds with regulators, critics and reporters, and questions remain about Tesla's production and manufacturing difficulties, long-term demand for its cars and uncertainty over funding. "My hope is all current investors remain with Tesla even if we're private," Musk tweeted. "Would create special purpose fund enabling anyone to stay with Tesla. Already do this with Fidelity's SpaceX investment." Analysts took Musk at his word. "I believe Tesla considers Tweets as public disclosure. I think he's serious. Plus this is short squeeze rocket fuel after a nice quarter," said analyst Chaim Siegel from Elazar Advisors. Short interest in Tesla on Monday stood at nearly $12 billion, equivalent to 28 percent of its float, according to S3 Partners, a financial analytics firm. George Galliers of Evercore ISI said he believed the tweet was serious. "I can't believe this is something to bluff or make fun of. Given his historic frustration with short sellers, analysts and certain parts of the press, it is perhaps also not surprising that he has given consideration to taking the company private," Galliers said. "Details, structure, participants and how the valuation has been determined remain to be seen." Earlier in the day, the Financial Times reported that Saudi Arabia's sovereign wealth fund, overseen by Crown Prince Mohammed bin Salman, has built an undisclosed stake of between 3 and 5 percent stake in Tesla.